Thoughts and findings. Anna Tokareva, MCT 2016, AUT. Digital Me is an interactive online experience created in 2015 by Sandra Guadenzi, an academic and consultant who specialises in interactive documentary and Mike Robbins, of creative studio Helios Design Labs. It was commissioned by BBC’s Taster, an online platform for testing out new ideas that involve experimental media. 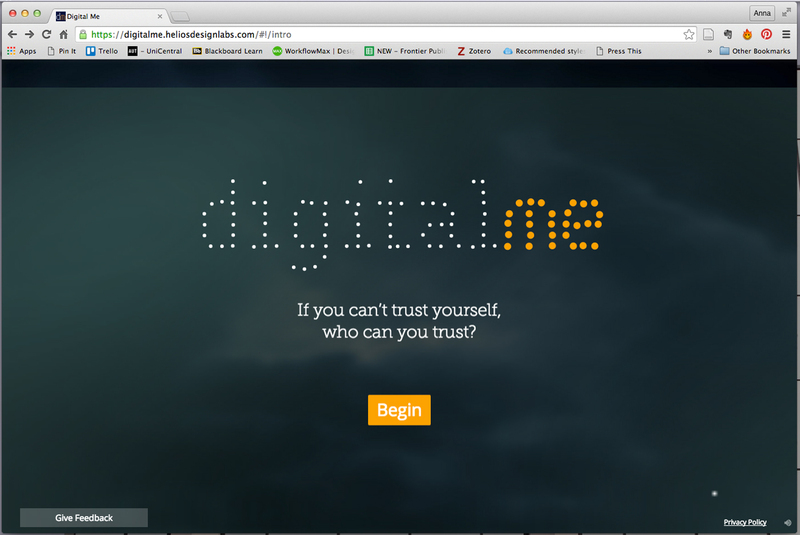 Digital Me allows the user to have a conversation with the digital version of themselves. Upon being granted permission, it maps the participant‘s facial features via their webcam and uses data gathered from Twitter and Facebook profiles to build a digital doppelganger. According to the creators, the experience is not intended to be frightening, it has been created to prompt some contemplation about the ways in which our personalities are reflected in the online environment, in comparison to the way we present ourselves in everyday life (Guardenzi, Robbins). It is not a conversation about surveillance, rather, it is about personal expression and the malleability of identity. The experience of interaction with Digital Me is rather limited. The participant is unable to type in their own questions or comments, instead they are guided to to partake in a predetermined conversation. This takes the appearance of a chat interface, making it feel like one is really talking to this entity. Sometime a multi-choice selection of possible answers is provided, so the participant has a greater illusion of control over the narrative. One of the initial steps involves the construction of a self-portrait based on data mapped from the webcam, in combination from fragments of the participant’s Facebook profile photographs. Giving this digital counterpart a figurative representation makes it feel more tangible and relatable. My experience of Digital Me was different to my initial expectations. I think the creators succeeded in making it feel safe. I generally tend to be fairly dystopian in my thinking around data collection and security issues, but Digital Me did not feel intrusive. Perhaps this is due to the fact that it collects publicly available data, so there were no major surprises in the assumption it made about me based on this information. My Facebook profile is private and I rarely post on Twitter. When I do, it is not personal information but links to articles that are on interest professionally or academically. I also tend to avoid showing my face in my profile photos. I imagine that Digital Me might be more revealing for someone who has a public Facebook profile and posts frequently about their personal life. In fact, at the end, I was left with a feeling of wanting to know more, to find out what other kinds of assumptions and propositions might be made based on my public profiles. It is an interesting topic, but I am not sure that Digital Me took it far enough. I was surprised by one part of the experience, when Digital Me guessed that my partner and I spend a lot of time together. This is probably to difficult to divulge, since our relationship is shown in my Facebook profile. Still, it is perhaps the wording that took me off-balance. This is the point where the boundary between digital and the physical me really crossed over, and I could see the influence of one upon the other. As Kathy Cleland explains in “Prosthetic Bodies and Virtual Cyborgs,” more and more of our functions have been externalised through the creation of various tools, that serve as extensions of our abilities (74-77). Is it possible for parts of our identity to begin existing online only, could characteristics, or emotions be externalised and enacted through digital tools? My own project seeks to explore the relationships between my physical body and the way its reactions can be mapped to a digital space. In Digital Me, the visualisation of the data was very important. The participant was quickly made to feel comfortable by being presented with a figurative representation of a face, a familiar chat interface, and images from their social media feeds. But could data taken from sensory interaction also be visualised in a way that gives a clue to its source, but perhaps not in such a blatant way? I would like to create a digital representation that embodies traces of the physical, but in ways that are more poetic and abstracted. The anxiety, worry and concern that we can feel about our data being archived, turned into profiles, and interpreted by algorithms is something that I would like to investigate and represent. Cleland, Kathy. “Prosthetic Bodies and Virtual Cyborgs” Second Nature 3 (2010): 71-101. Web. 2 June 2016. Guadenzi, Sandra and Mike Robbins. “Digital Me, Who Are You?” Helios Design Labs. Helios Design Labs. Web. 9 Jun. 2016. Guadenzi, Sandra and Mike Robbins.. Digital Me. 2015. BBC Taster. Web. 5 Jun. 2016.